Individual performs legal functions for the County through the office of the District Attorney. Responsible for the prosecution of misdemeanor and felony criminal caseload from preliminary hearing through trial and appeal. Prepares and argues motions and appeals in the Court of Common Pleas and Appellate Courts. Works closely with law enforcement in the preparation and prosecution of cases. Advises and counsels civilian and police witnesses, and victims in preparation for trial or pre-trial hearings. Responsible position which requires a great deal of independent judgement. There is a slight potential for danger due to clientele. Graduate of a recognized college or university and from an accredited law school. Must be able to pass pre-employment background check and drug screening, as required by Lycoming County. Licensed to practice law before the Courts of the Commonwealth of Pennsylvania. Interested applicants should send resume and cover letter the Lycoming County District Attorney, Kenneth Osokow at MWade@lyco.org, or by mail to the Office of District Attorney, 48 West Third Street, Williamsport, Pa 17701. Willingness to provide in-court support to counties. 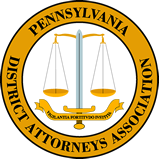 If interested, please submit a resume and cover letter, including salary requirements, to PDAA’s Patty Blascovich at pblascovich@pdaa.org by Friday, April 5, 2019. Blair County Assistant District Attorney position in general prosecution, handling all aspects of criminal prosecution including but not limited to, summary appeals, preliminary hearings, court proceedings, trial and appellate work. Starting at $35,000.00 compensation and benefits. Prerequisites: Graduation of an ABA accredited law school and from a recognized college or university; licensed to practice law before the Court of the Commonwealth of Pennsylvania.